I like video games, and I like being surprised. 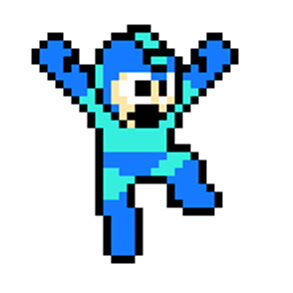 That's why today brought good news on both fronts with the revelation that a beloved childhood past time, the Mega Man series, will return to the consoles of Nintendo loyalists in the form of Mega Man 9 — a new sequel to the original series that began in 1987, in the earliest days of the Nintendo Entertainment System. Surprise number one: a new installment of a series that hasn't been officially updated since 1996. Even more notable that merely continuing the series, however, publisher Capcom has chosen to do so in an unusual way: with the graphic style of those antiquated, first-generation NES games and not in the flashy way that newer systems are capable of. Thus, surprise number two: decidedly retro graphics. It's an odd move, but for a lifer like me, it's a welcome one in that it further supports my belief that game designers have wisely chosen to capitalize on the gaming nostalgia and mine the past twenty years of blips and bleeps. The retrotastic look, however, doesn't mean the game doesn't take the series forward, if only by a small step. 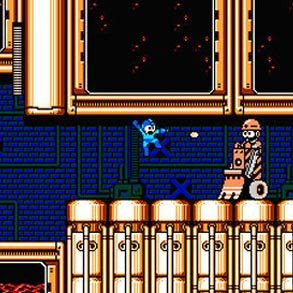 For those who never played through a Mega Man game, the formula is simple: As the titular hero, you shoot and hop through eight levels, each of which end with a duel with a Robot Master end boss. Throughout each of the games, the Robot Master has a unique name and schtick to match. 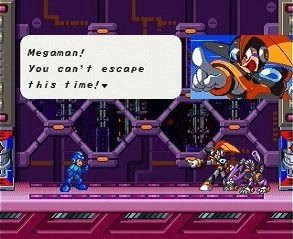 Despite the uniqueness of each, the Robot Masters share one common trait, which can be easily guessed by reading a list of them. Here is that list: Cut Man, Guts Man, Elec Man, Bomb Man, Ice Man, Fire Man, Metal Man, Air Man, Bubble Man, Quick Man, Flash Man, Crash Man, Heat Man, Wood Man, Needle Man, Gemini Man, Hard Man, Magnet Man, Top Man, Snake Man, Spark Man, Shadow Man, Bright Man, Toad Man, Drill Man, Pharaoh Man, Ring Man, Dust Man, Dive Man, Skull Man, Gravity Man, Wave Man, Stone Man, Gyro Man, Star Man, Charge Man, Napalm Man, Crystal Man, Blizzard Man, Centaur Man, Flame Man, Knight Man, Plant Man, Tomahawk Man, Wind Man, Yamato Man, Freeze Man, Junk Man, Burst Man, Cloud Man, Spring Man, Slash Man, Shade Man, Turbo Man, Tengu Man, Astro Man, Sword Man, Cloud Man, Search Man, Grenade Man, Frost Man, Aqua Man, Dynamo Man, Cold Man, Ground Man, Pirate Man, Burner Man, Magic Man, Oil Man, and Time Man. Quite a list, even if I’d be hard pressed to explain the difference between Fire Man, Heat Man and Flame Man. Did you spot the overriding similarity? If you did, know that it would appear to no longer be the case. According to what blogs are saying about Mega Man 9, the list of Robot Master includes one important difference. It reads as follows: Magma Man, Galaxy Man, Jewel Man, Concrete Man, Hornet Man, Plug Man, Tornado Man, and Splash Woman. Yes, a gynoid. A Fembot. A female Robot Master. 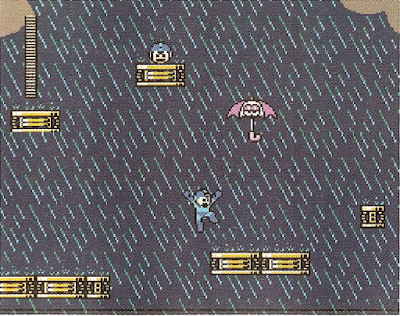 Splash Woman might seem like a relatively unremarkable addition in the context of the seventy-some preceding her, but her presence is nonetheless a sign that the people who make video games have at least begun to acknowledge that they’ve been excluding an element for the past twenty years. Surprise number three: a move towards gender equality, even if it remains to be seen how intimidating some robot named Splash Woman could be. I'll simply state surprise number four: Capcom will release Mega Man 9 for specifically for the Wii Virtual Console, meaning that I can obtain this pseudo-lost wonder the moment it becomes available. Finally, I should note that news of the new "old" Mega Man comes not from the gaming blogs that usually tell me of such things nowadays, but from good ol' Nintendo Power, a magazine I read as a child but I figured had become irrelevant by now. (Well, to get technical about it, I heard it from the websites, which in turn heard it from Nintendo Power. But still.) Surprise number five: Nintendo Power not only exists but actually scoops the world of web media occasionally.